The Kent & East Sussex Railway in Tenterden was the first heritage railway in the UK to sell tickets to meet Santa on a moving train. The first tickets went on sale in 1974, the same year that the railway was granted a Light Railway (Transfer) Order to allow it to operate a heritage steam railway between Tenterden and Rolvenden. The railway now operates over a greater distance of 10 ½ miles between Tenterden and Bodiam. As the popularity of the ‘Santa Specials’ has grown year on year they provide a valuable revenue stream which is now essential to the continued running of Tenterden’s Steam Railway. Many other heritage railways across the country have followed in the footsteps of the Kent & East Sussex Railway and are now also raising essential annual revenue from their own ‘Santa Specials’ experience. 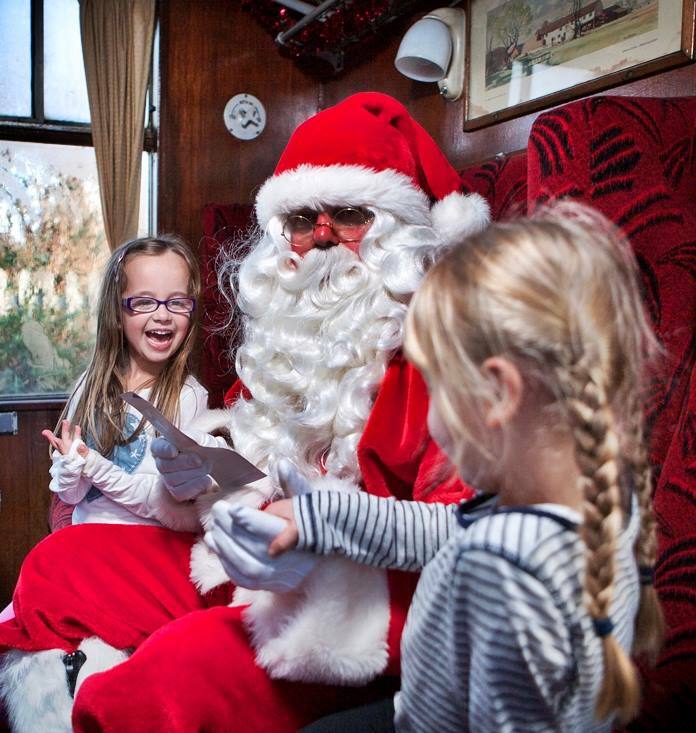 Helen Douglas, Product and Reservations Manager at the railway said: “We were the first Heritage Railway in the UK to give children the much beloved experience of having Santa come and talk to them and give them a present whilst on a steam train journey. This format is now well recognised as a ‘Santa Special’ experience and this year we have sold more than 50% of our tickets already. Today the ‘Santa Specials’ experience has grown and now offers additional entertainment at Tenterden Station with unlimited rides on a beautiful Victorian carousel and a chance to walk through a delightful miniature Christmas model village. On board the experience is much as it began with a festively decorated steam train where every child can meet Santa and his elves during a 1 hour 10 minute return journey. Every child receives an age appropriate gift from Santa and older children between 13 and 15 receive a box of festive chocolates. Everyone also receives complimentary refreshments too - a mince pie and choice of soft or alcoholic drink for adults and a soft drink & chocolate bar for children. Babies under 18 months of age at the time of travel are free of charge (providing they are not occupying a seat) and there's a little free gift for them too! Every family also receives a free family group photograph to take home as a momento of their special day. Standard Class Tickets are still great value and start at £18. First Class Tickets from £24. Private Standard Family Compartments from £160 (for up to eight people). This year the Santa Specials will operate on 2, 3, 9, 10, 16, 17, 22, 23 and 24 December 2017. To book visit www.kesr.org.uk or call 01580 765155. First Class Seats and Standard and First Class Compartments have limited availability and may only be booked by telephone.